I have one card of Orlando Arcia, from 2014 Bowman Chrome Prospects. Playing career: Shortstop Orlando Arcia was sixteen years old when he began his career in the Brewers organization, and at age 22 has become their shortstop of the future. 2015 was his breakout season, as he hit .307 with 8 HR, 69 RBI and 25 SB at AA Biloxi. My memories: I posted this card when I got it from a street pack recently, saw it quickly and thought it was Oswaldo Arcia, thinking he must have been in the Brewers organization at some point. Then Brewers blogger Tony L. commented that this was a great card to get. Until then I didn’t realize that Oswaldo had a younger and probably more talented brother. Where he is now: He made his major league debut in 2016, hitting .219 with 4 HR and 17 RBI in 55 games. Google Autocomplete results: He is second when you type Orlando A, between Orlando Airport, referring to Orlando International Airport, and Orlando Anderson, a suspect in the Tupac Shakur murder. Coming up next: The next profile will be Shawn Armstrong. 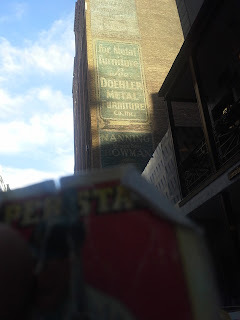 Doehler Metal Furniture was a prominent manufacturer of metal furniture during World War II. It was acquired by Metal Office (now known as Steelcase) in 1936. Their furniture now commands hundreds of dollars at auction. Also visible under the Doehler sign is one for Manning-Bowman, a kitchen appliance manufacturer acquired by McGraw-Edison in 1960. Both of these signs are visible on 32nd Street near Lexington Avenue. I have two cards of Chase Anderson. This one is from 2015 Topps. 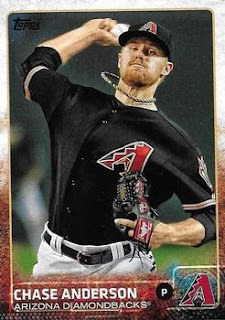 Playing career: Chase Anderson was a decent starting pitcher for the Diamondbacks in 2014 and 2015. In 48 starts he went 15-13 with a 4.18 ERA. Where he is now: Before the 2016 season Arizona traded him to the Brewers for Jean Segura. In his first year in Milwaukee Anderson went 9-11 with a 4.39 ERA. Google Autocomplete results: He is second when you type Chase An, between Chase Android Pay, a digital payment system, and Chase and Status, a music production team. There do not appear to be any other prominent Chase Andersons. Coming up next: The next profile will be Orlando Arcia. Brian from Highly Subjective and Completely Arbitrary has been trying to thin out his trade boxes. I was happy to take on a bunch of cards from the late 1990s and early 2000s, everybody's trouble spot, in exchange for a bunch of Twins cards. Not every card was from that era - in this trade I got my first '17s! I know its fashionable to rag on the design but to me photo selection is more important than design so this set is a winner for me. Similarly, I don't mind the changes to the backs either - I'd rather see an interesting write-up than the same stats again and again. I like this one because I was at the game against Toronto mentioned on the back. Too bad Aaron Judge pretty much fell off a cliff after those first three games. 6'7", strikes out a ton. Hopefully has similar power though. Here's a nice photo from '05 Fleer Tradition. Notice the facsimile signature at the bottom. They were part of the card design that year. Except, it seems, when they couldn't find a signature for a player, leading to this funny-looking repetition of the player's name in print and then printed cursive. Under the Chrysler Building is the Chrysler Arcade - a small hallway of stores accessible from a subway entrance on 42nd Street. Most of the location was a Duane Reade that closed recently, and there is also a locksmith, cleaners, barber shop and deli. 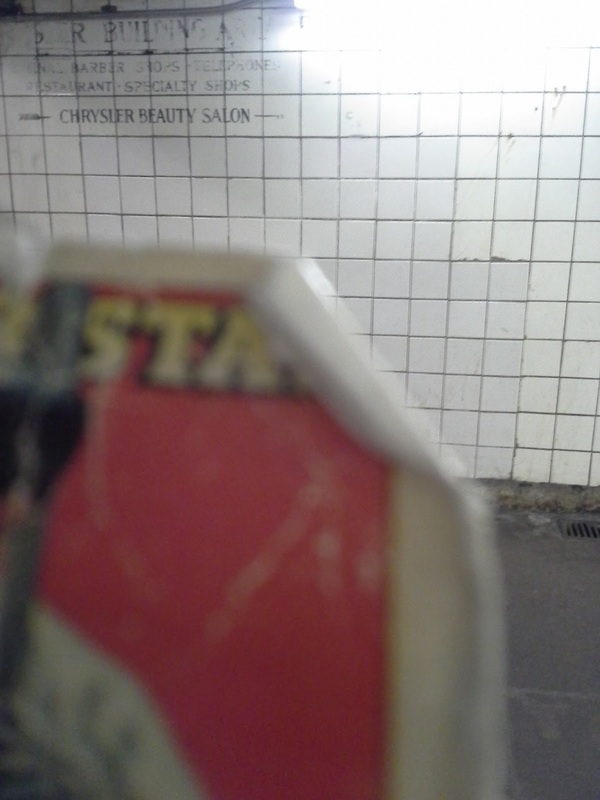 No more Chrysler Beauty Salon though (and no more pay telephones either). I have one card of Dariel Alvarez, from 2016 Topps. 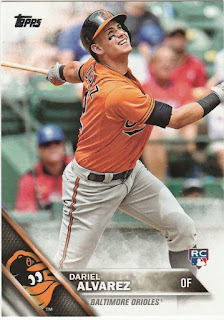 Playing career: Outfielder Dariel Alvarez came up with the Orioles in 2015, hitting .241 with 1 HR and 1 RBI in 12 games. Where he is now: He played in two games for the Orioles in 2016, hitting a double in three at bats. Google Autocomplete results: He is first when you type Dariel, ahead of Dariel Abreu, referring to White Sox star Jose Dariel Abreu. There do not appear to be any other prominent Dariel Alvarezes. Coming up next: The next profile will be Chase Anderson. I have three cards of Miguel Almonte. This one is from 2016 Topps Opening Day. 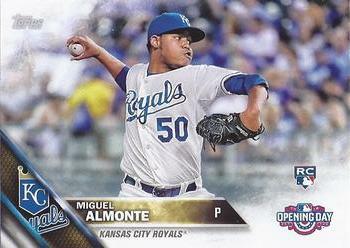 Playing career: Miguel Almonte made his major league debut for the Royals in 2015. In nine appearances he went 0-2 with a 6.23 ERA. Where he is now: He spent all of 2016 in the minor leagues, split between AA NW Arkansas and AAA Omaha. In 32 games he went 5-8 with a 5.92 ERA. Google Autocomplete results: He is seventh when you type Miguel Al, between Miguel Algarin, a Puerto Rican poet, and Miguel Aleman, former President of Mexico. There do not appear to be any other prominent Miguel Almontes. Coming up next: The next profile will be Dariel Alvarez. I have one card of Scott Alexander, from 2016 Topps. 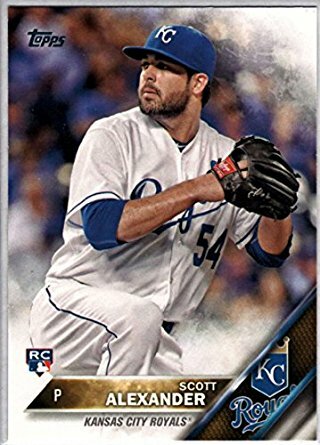 Playing career: Scott Alexander was drafted by the Royals in the sixth round in 2010, and made his big league debut going 0-0 with a 4.50 ERA in four games in 2015. Where he is now: In 2016 he made 17 appearances, going 0-0 with a 3.32 ERA. Google Autocomplete results: He is sixth when you type Scott A, between Scott Adsit, an actor, and Scott Anderson, an author. The first entry when you google Scott Alexander is not the ballplayer but a personal trainer. Coming up next: The next profile will be Miguel Almonte. 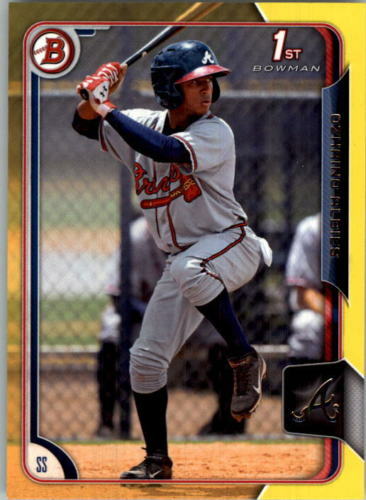 I have one card of Ozhaino Albies, from 2015 Bowman Prospects Yellow. Playing career: Shortstop Ozhaino Albies is one of the top prospects in the Braves system. He tore through two rookie leagues in 2014, hitting .364 with 1 HR, 19 RBI and 22 SB. He was very solid at Class-A Rome in 2015, hitting .310 with 0 HR, 37 RBI and 29 SB. Where he is now: He split 2016 between AA Mississippi and AAA Gwinnett, hitting .292 with 6 HR, 53 RBI and 30 SB. Google Autocomplete results: He is first when you type Ozh, ahead of Ozhivu Divasathe Kali, an Indian film. There do not appear to be any other prominent Ozhaino Albieses. Coming up next: The next profile will be Scott Alexander. When the Sixth Avenue elevated train was torn down in the 1930s, 38th street lost its subway stop. 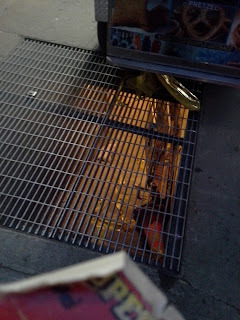 To partially make up for it, a 38th Street exit was included in the pedestrian tunnel that was built along Sixth Avenue from 34th Street to 42nd Street. Generations of New Yorkers used the pedestrian tunnel to get out of the rain and cold, but after some horrific crimes in the 1980s and early 1990s, this tunnel and others like it were closed in 1991. You can see the tunnel, dark and deserted at night, in this 1991 video taken shortly before it was closed for good. The tunnel is closed to pedestrians, but is still used for access and storage for the MTA. And while the pedestrian entrance has been paved and grated over, access to the stairs still remains for occasional use by the MTA. If the light is on in the tunnel in the evening, you can still see down the stairs and into the long-disused tunnel. If you zoom in on the image you will clearly see the stairs with a length of yellow caution tape going down them. I have one card of Spencer Adams, from 2015 Bowman Draft. Playing career: Spencer Adams was the White Sox’ second-round pick in 2014, and he had a phenomenal 2015, going 12-5 with a 2.99 ERA in A-ball. Where he is now: He moved up to AA Birmingham halfway through 2016. Overall his numbers for the year were 10-12 with a 3.98 ERA. Google Autocomplete results: He is fifth when you type Spencer A, between Spencer Ackerman, a national security reporter, and Spencer Althouse, Community Manager at BuzzFeed. Another prominent Spencer Adams was an infielder for four major league teams in the 1920s. Coming up next: The next profile will be Ozhaino Albies. 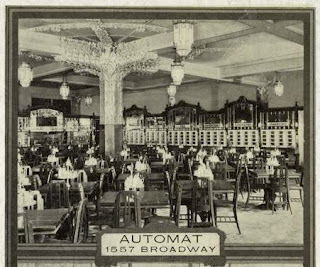 The Horn and Hardart Automat chain was a revolution in quick service dining. A precursor to fast food restaurants like McDonald's and Burger King, you would stick your coins in a slot next to a glass container with the food you wanted, and the container would open to give you your food. Originally started in Philadelphia, the company opened their flagship New York store in Times Square in 1912. The building was intricately decorated, with the centerpiece being an ornate floral design on the ceiling of the first floor. By the 1960s and 1970s the Automats were going out of business, with many of the locations including this one becoming Burger Kings. Now it is a shop called "Grand Slam" selling knickknacks to tourists. However, remnants of the ceiling sculpture can still clearly be seen above the "Make America Great Again" T-shirts. When Burger King owned the former Automat location in the 1970s, they put shingles on the outside to make them look like every other Burger King in the country, no matter how incongrous they looked on the side of a large city building. 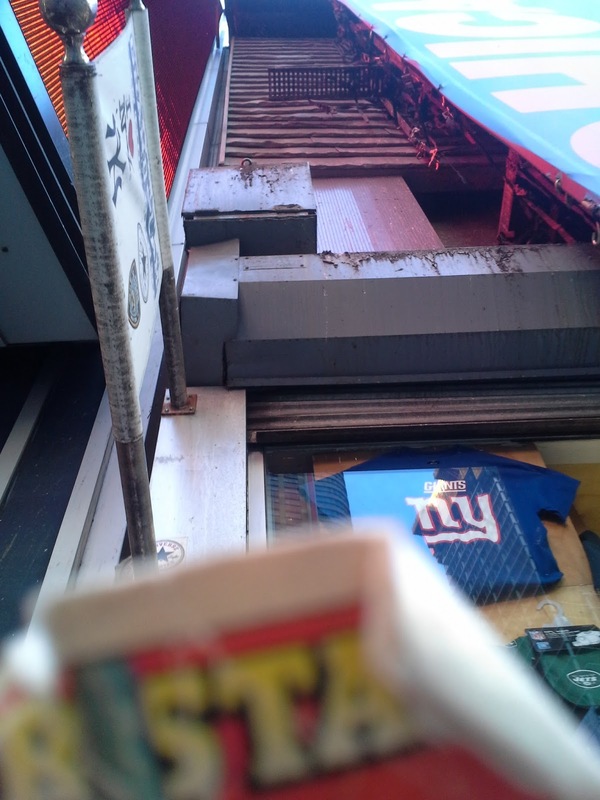 Those shingles can still be seen poking out from behind the large billboard that now covers the store's exterior. I have one card of Austin Adams, from 2015 Topps Update. 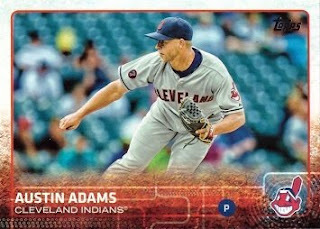 Playing career: Austin Adams came up with the Indians in 2014 and became a key member of their bullpen in 2015, going 2-0 with a 3.78 ERA in 28 games. Where he is now: 2016 was much rougher for Adams, as he went 0-0 with a 9.82 ERA in 19 games. Google Autocomplete results: He is second when you type Austin Ad, between Austin Adventures, a travel website, and Austin Advisory Group, a marketing agency. Another prominent Austin Adams is a singer. Coming up next: The next profile will be Spencer Adams. 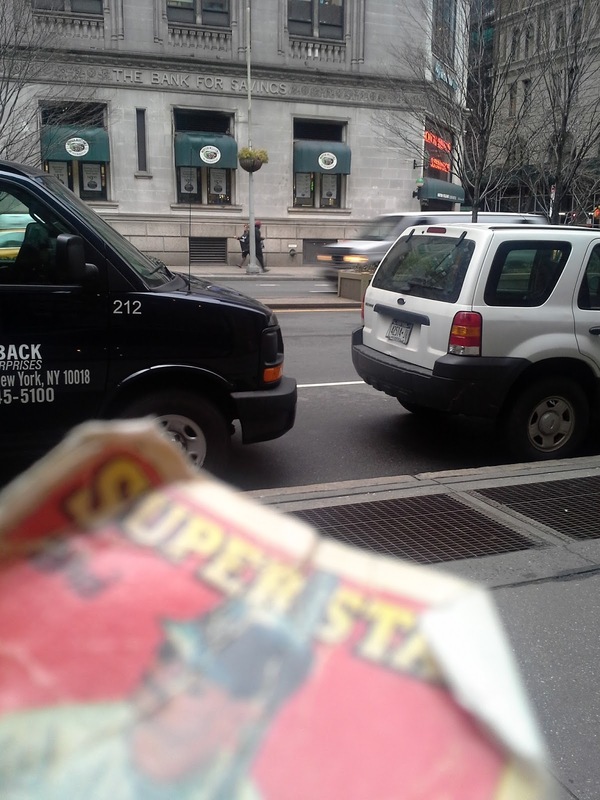 Back when I started doing a wallet card in January 2015, I mentioned that I would take requests for locations in or around midtown Manhattan or Long Island. (Still happy to do so.) The first request came from Unclemoe of the 2008 Topps Set Blog, who asked for the Carnegie Deli. That ended up being one of my first wallet card posts. The Carnegie Deli closed at the end of 2016, and its iconic sign is gone. I figured I would do a follow-up Wallet Card photo with the now-former Carnegie Deli. 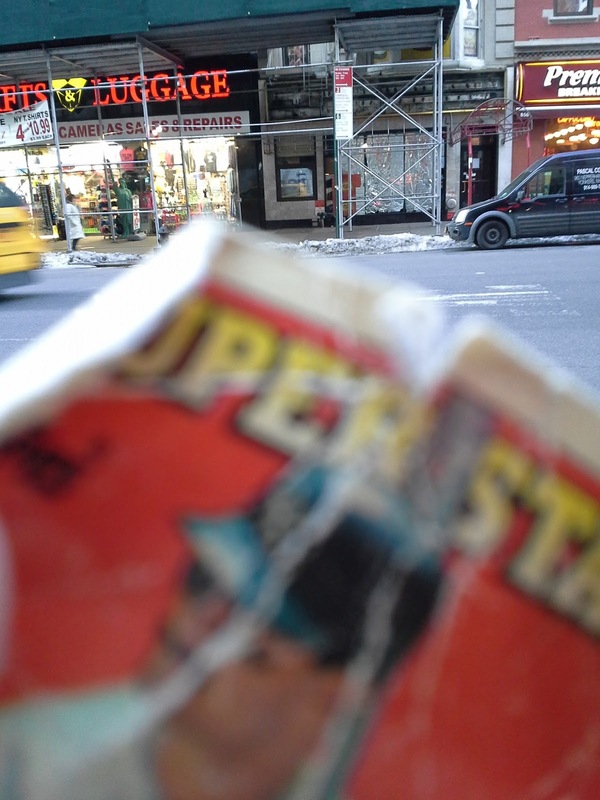 The sign is gone, the windows are boarded up, and the wallet card looks a lot worse for wear two years later. I have one card of Ronald Acuna, from 2002 Bowman. Playing career: Outfielder Ronald Acuna played eight seasons of professional baseball, mostly in the Mets organization. In 879 games he hit .282 with 18 HR, 389 RBI and 187 SB. Interesting facts: His son, also named Ronald Acuna, is a top prospect in the Braves organization. Where he is now: Anyone know where Ronald Acuna is now? Google Autocomplete results: He is first when you type Ronald A, ahead of Ronald and Nancy Reagan, referring to the former First Couple. There are no entries for the older Acuna on the first page of Google results, all of which refer to the younger one. Coming up next: The next profile will be Austin Adams. 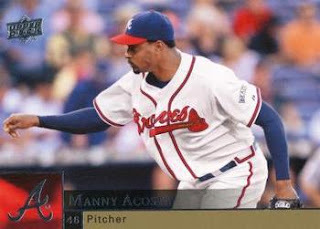 I have one card of Manny Acosta, from 2009 Upper Deck. Playing career: Manny Acosta pitched for the Braves and Mets from 2007 to 2012. In 233 games, all in relief, he went 13-13 with 9 saves and a 3.99 ERA. 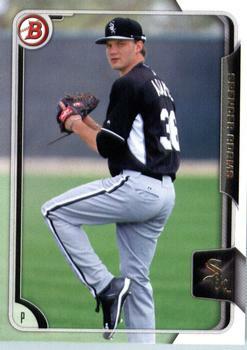 Where he is now: Last year he was 6-5 with a 4.40 ERA for the Diablos Rojos in the Mexican League. Google Autocomplete results: He is fifth when you type Manny A, between Manny and Simon, a toy company, and Manny Azenberg, a theatre producer. Another prominent Manny Acosta is a singer. Coming up next: The next profile will be Ronald Acuna. 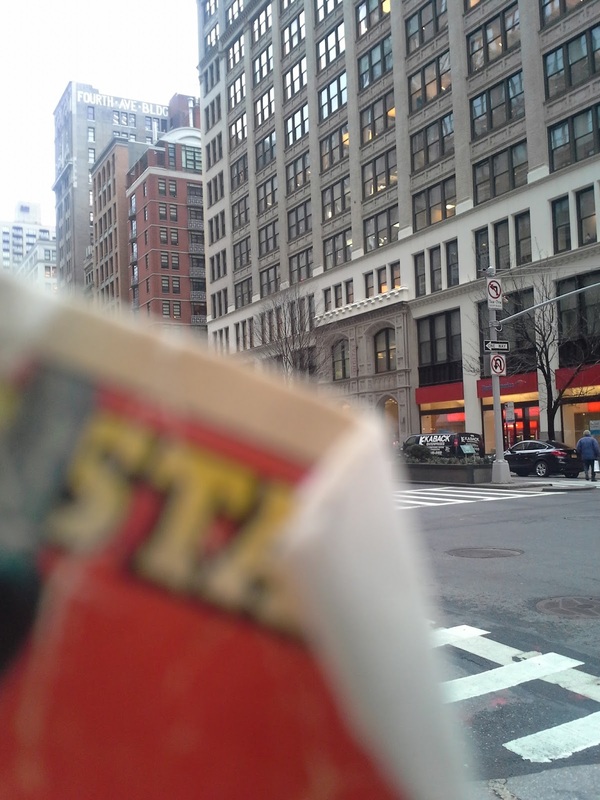 Manhattan has First Avenue, Second Avenue, Third Avenue, Fifth Avenue, Sixth Avenue, etc...but no Fourth Avenue. There used to be a Fourth Avenue, but most of it was renamed Park Avenue around the turn of the 20th Century, and in 1959 the last stretch of Fourth Avenue became Park Avenue South. However, 381 Park Avenue South still retains its old name, the Fourth Avenue Building, on a sign at the top of the building. Here it is, the final card from the three Spokane Indians sets. (That 1986 set is still out there but I am not paying $100+ for a minor league card set, even a rare one.) First baseman Dave Staton came up with the Padres in 1993 and hit 5 HR and had 9 RBI in just 17 games, after hitting .315 with 25 HR and 71 RBI at AAA Las Vegas. I thought he would be a big star when I saw those numbers on the back of his 1994 Topps card, the first time I had heard of him. I didn't realize at the time that offensive numbers in the PCL are greatly inflated, and indeed Staton did little more in the majors, washing out after hitting .182 with 4 HR and 6 RBI in 29 games in 1994. A fuller account of his career can be found at The Greatest 21 Days. Staton is at Mother's Cupboard, a natural foods and supplements store started in 1977 and still serving the Eastern Washington/Northern Idaho region. He is posing with Nature's Way products - the company was founded in 1968 and is also still going strong today, but appears to no longer be sold at Mother's - they don't have any Nature's Way products on their website. The Bank for Savings was chartered in 1819 as New York's first savings bank, begun to help finance the Erie Canal. In 1892 this branch was built at 22nd Street and 4th Avenue (now Park Avenue South). In 1982 The Bank for Savings merged with State Buffalo Savings Bank and was renamed Goldome Bank for Savings (after the gold dome at the Buffalo headquarters). In 1991 the bank was liquidated, with its assets sold to several other banks. 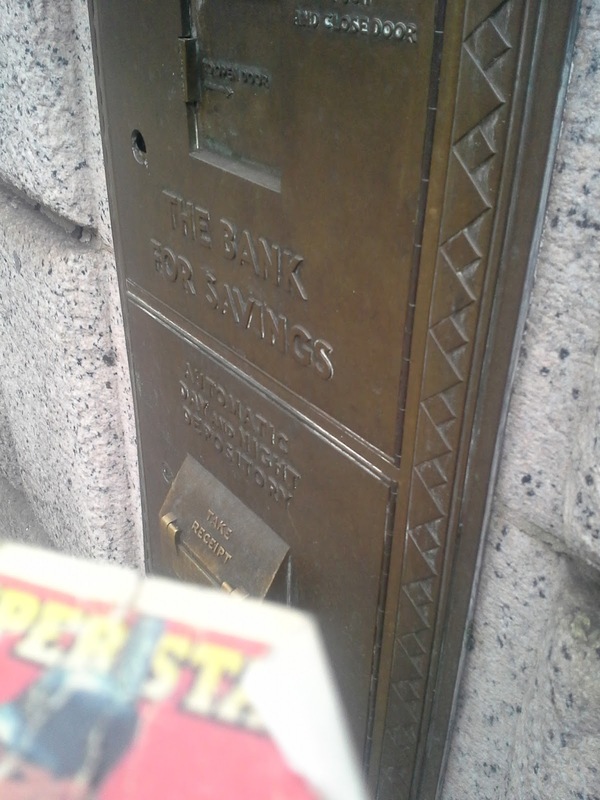 This location is now a supermarket, but still bears the Bank for Savings name written above the ground floor. . .
. . . as well as on the night depository safe still in the supermarket's wall. Bill Johnson pitched in the Padres organization from 1989 to 1992. In 84 games he went 9-22 with a 7.95 ERA. Candy 'n' Carmelcorn has been in every set. Not much left to write about a food court kiosk. Federation Bank and Trust was established by labor leader Peter Brady in 1923, and ten years later it was the largest labor bank in the United States. It continued to be a major New York bank after World War II. Former Yankees infielder Snuffy Stirnweiss, an All-Star in 1946, worked there briefly before being killed in a train crash in 1958. Vince Lombardi was a public relations executive for the bank between leaving his assistant coach position with the Giants (many of the Giants had accounts there) and joining the Packers as head coach. In 1968 the bank was acquired by Franklin National Bank. 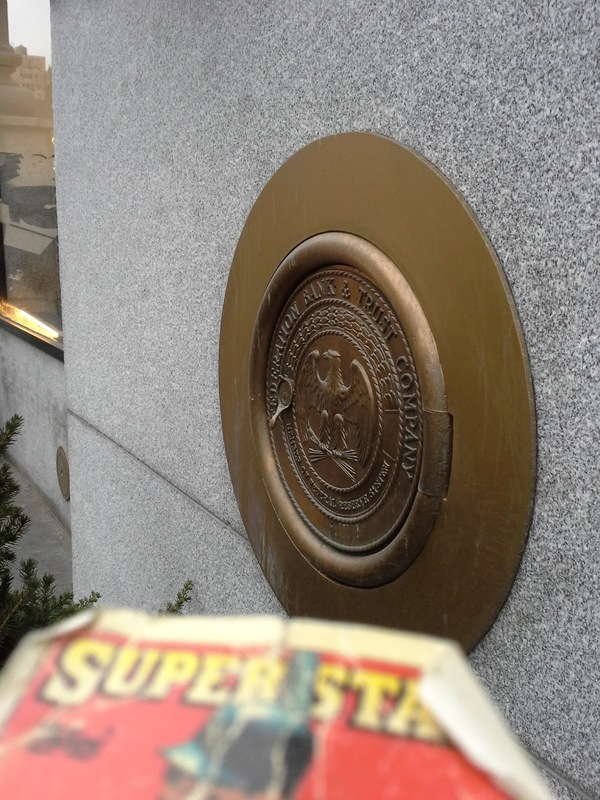 A night safe bearing the bank's name can be found on what is now a CVS on Eighth Avenue. Outfielder Jeff Barton played in the Padres organization in 1989 and 1990. In 152 games he hit .251 with 6 HR and 86 RBI. A fuller account of his career can be found at The Greatest 21 Days. He is now Vice President & Regional General Manager at MobilexUSA, a mobile laboratory service. In 2014 he answered my questions about baseball cards. About this set, he wrote, "When I was drafted by the San Diego Padres, our first baseball cards were taken in front of stores in the local Spokane, WA mall. Later our team held a card signing in the mall and the signing went on for two hours…I’m still amazed that I had a baseball card and even more surprised that someone actually wanted my autograph." I'm not sure where he is in the mall, looks like some kind of gifts/knickknacks shop. The store name on the little card on the table is too small to read. The department store chain J.W. Mays (not to be confused with May Department Stores) originally opened in Brooklyn in 1924, and at its peak operated nine stores in NYC and Long Island before going out of business in 1988. Although the store chain no longer exists, J.W. Mays, Inc. still exists to manage the commercial real estate properties formerly occupied by its stores. One of the Mays stores on Long Island became Tri-County Flea Market, where I often go to buy cards. For years the door handles at the main entrance had MAYS in big letters on them - I initially thought Mays was the door company before I learned more about the store's history. 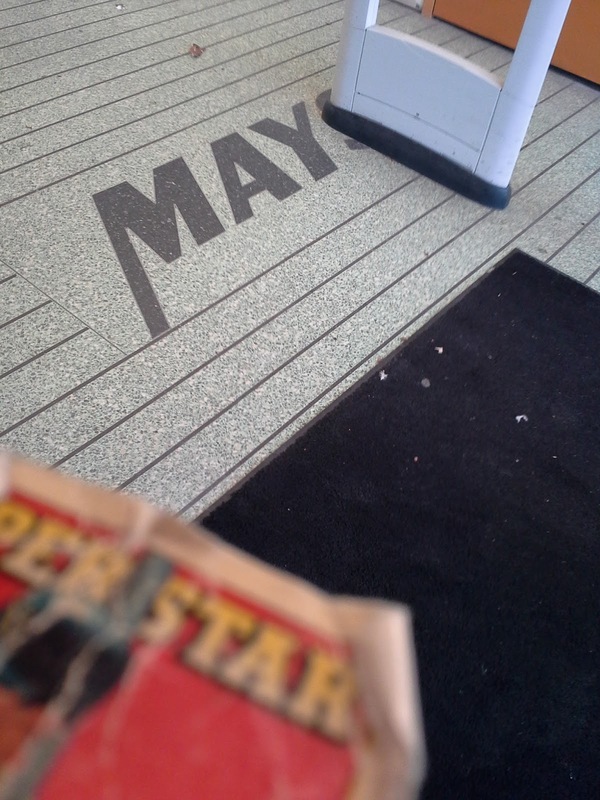 The doors were replaced before the #WalletCard project started, but I recently read that you could still see a Mays sign on the floor at a side entrance, so I knew I had to go back and take this picture. Infielder Steve Bethea played in the Padres organization from 1989 to 1994. In 422 games he hit .219 with 3 HR, 118 RBI and 39 SB. When I posted his player profile on this blog three years ago, commenter Bubba Russell noted that he lives right outside of Austin, TX with his wife Carol and a young girl named Brooke. A fuller account of his career can be found at The Greatest 21 Days. The Regis Hair Salon chain has been featured in all three years of this set. A baseball-related factoid about the company is that Minnesota Twins owner Carl Pohlad almost bought the company in 1989. Recently Gavin of Baseball Card Breakdown posted a photo of his Wallet Card at a Studio 54 themed party. 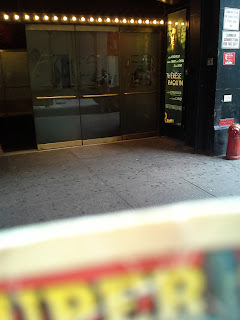 That reminded me that I had taken a wallet card photo at the doors at 254 W. 54th street a long time ago but never posted it, I think because they are not the original doors. 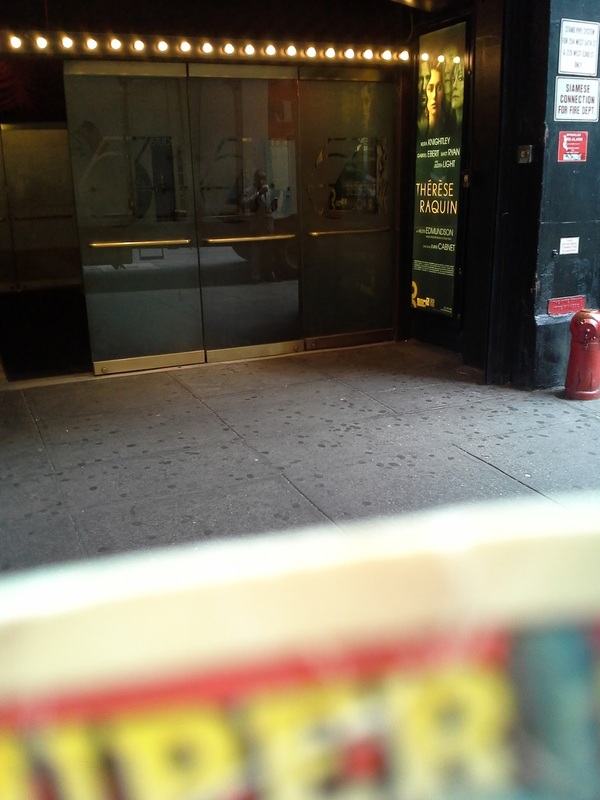 The original Studio 54 closed in 1980, and became various other venues since then, but since the late 1990s it has been home to a theater company that has revived the "Studio 54" name. Outfielder Rico Coleman played in the Padres organization in 1989 and 1990. In 162 games he hit .214 with 1 HR, 40 RBI and 28 SB. A fuller account of his career can be found at The Greatest 21 Days. The first Dog's Ear t-shirt shop was opened in Vancouver, BC in 1974. It was founded by Butts Giraud, a former CFL defensive tackle, professional wrestler, and four-time World Bellyflop and Cannonball Diving champion. There are still eight Dog's Ear stores throughout British Columbia, although they no longer have US stores. I picked up several Yankees from 1992 Bowman. Not a set you see in dime boxes much. Thanks to Baseball Every Night I'll now think of Olivia Newton-John every time I see a Pinnacle card. This one is a sample card. I love the shiny background on this card. This card commemorates Reggie Jackson's three-HR game at Yankee Stadium, but the picture is on the road. (Dodger stadium?) I don't care though because I like the photo. Joe Thatcher pitched for the Padres, Diamondbacks, Angels and Astros from 2007 to 2015. In 405 games he went 11-15 with 1 save and a 3.38 ERA. Now the Associate Head Coach at Indiana University Kokomo, he kindly answered my questions about baseball cards. "I collected baseball cards from a very young age and still have my collection stored away... My favorite card of myself was the first one I ever saw. It is of me in my pitching motion and we are wearing the camo jerseys with the tan pants. I think its cool because those were the first camo jerseys ever worn. 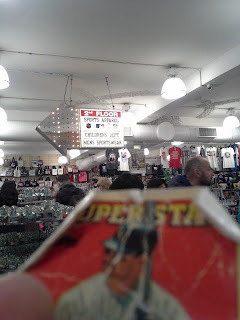 Obviously it is special too because seeing myself on a card was a dream come true... As a kid, I remember using my candy money after tee ball and little league games to buy cards rather than buy candy. Then me and my friends would go sit down together and open our packs which was a lot of fun."